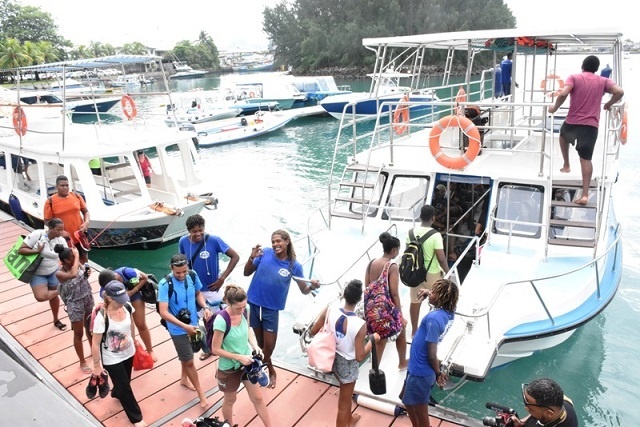 (Seychelles News Agency) - Secondary students on an exchange programme from Reunion are learning more about a fellow ‘Vanilla Island’ and speaking French every day for a week. Coinciding with ‘La Fête de la Francophonie’, 25 students from Collège Jean Albany of La Possession, Reunion, are currently in Seychelles for the first leg of the exchange with the English River Secondary School. A group of Seychellois students will travel to Reunion later in April. “We are part of the Vanilla Islands group, but it is mostly adults who come for exchanges. This is why we thought it was a good idea to join the exchange. It also gives our student and their parents the chance to communicate in French for a week, which is not always done willingly,” said Brenda Andimignon, the project coordinator of English River school. “The stay so far has been very educational in regards to the things that I have seen and learnt. I discovered the educational system of Seychelles differs from that of Reunion,” said Annecy Pougary, a Reunionnais student. “I am excited to see the volcanos in Reunion as I’ve never seen one and to experience the island as a whole,” said Joshua Agyei, a student form English River.